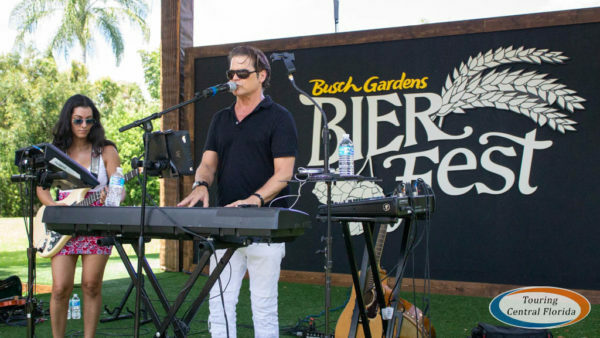 Busch Gardens Tampa Bay’s newest event, Bier Fest, kicked off last weekend. 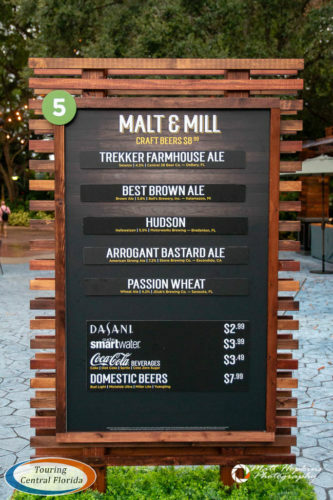 The beer focused festival brings more than 100 brews to the park over four weekends, along with a variety of culinary options, entertainment and more. Below is our in-depth look at the event, including what to expect when you visit, a look at the menus with pricing, and our review of certain culinary items and the event as a whole! 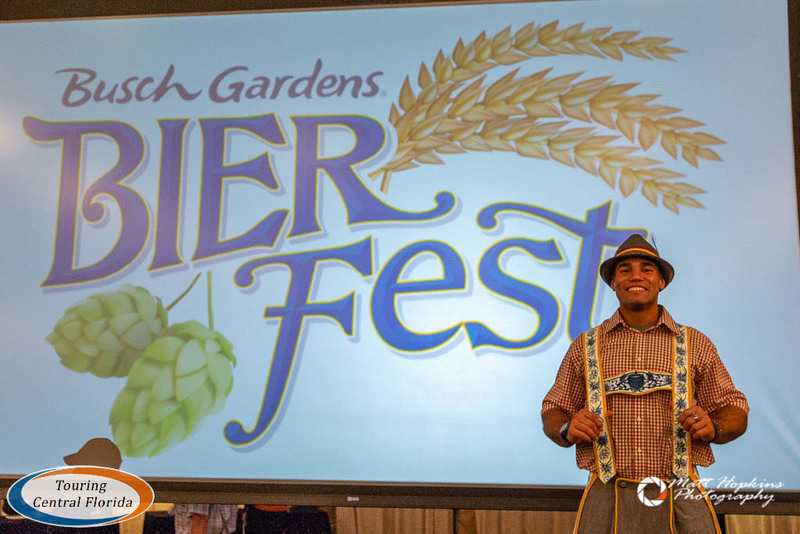 While we attended the first day of Bier Fest using our own paid admission, we did receive an invitation to the the VIP kick off event and two sampler lanyards which we used on the food items reviewed within this article. As always, all opinions in the article are our own. 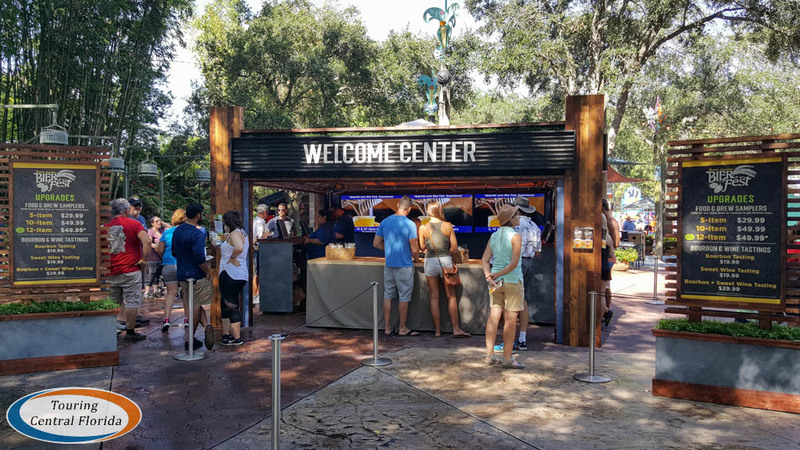 *NOTE: Article updated on 9/2/2018: A new beer booth was added for the second weekend of the festival – Right on Stein. 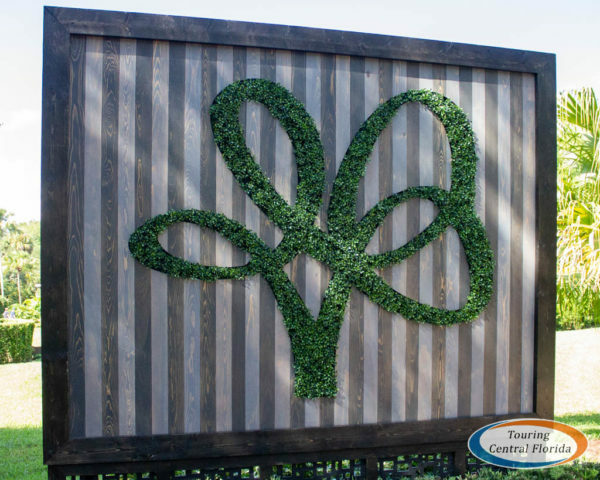 With the addition of this booth across from the stage near Garten Gate, the maps around the festival area have been updated and renumbered. Right on Stein is now booth #9, with the remaining on that side of the festival being renumbered. 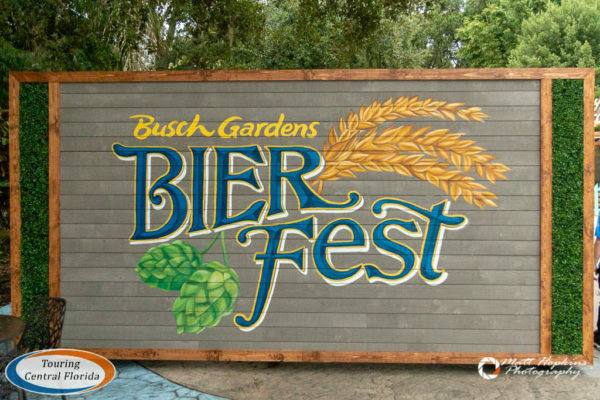 The all new Bier Fest at Busch Gardens Tampa runs weekends through September 16th. This weekend will also see the event running on Monday, which is Labor Day. 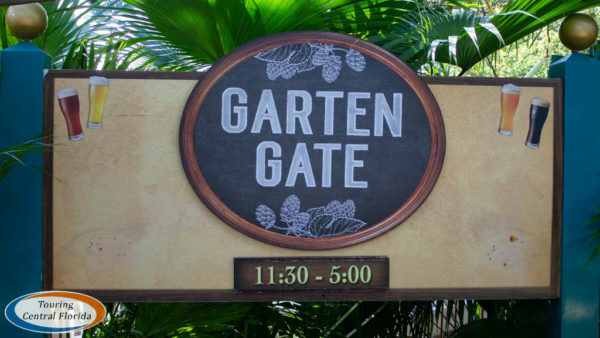 You’ll find all of the Bier Fest activities along the main pathway between Zagora Cafe and Garden Gate Cafe (renamed Garten Gate for the event). The beer and food booths open at noon; the Welcome Center opens earlier for sampler lanyard purchases and general festival information. 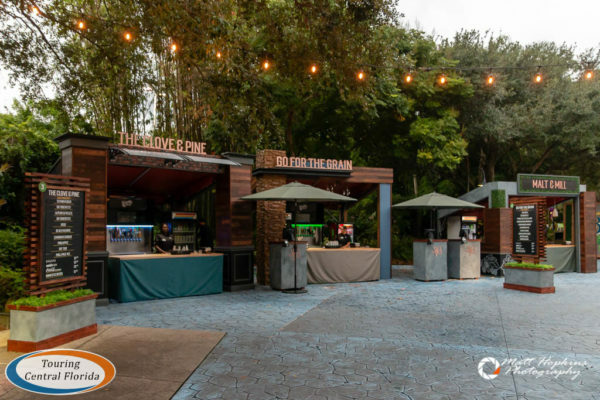 Each of the beverage and food booths has some detailed theming and a beer fest inspired name, like The Best of the Wurst and Go for the Grain. Also, keep an eye out for some great photo op spots. While there is a brochure available at the Welcome Center with some Bier Fest information, it doesn’t contain a map. 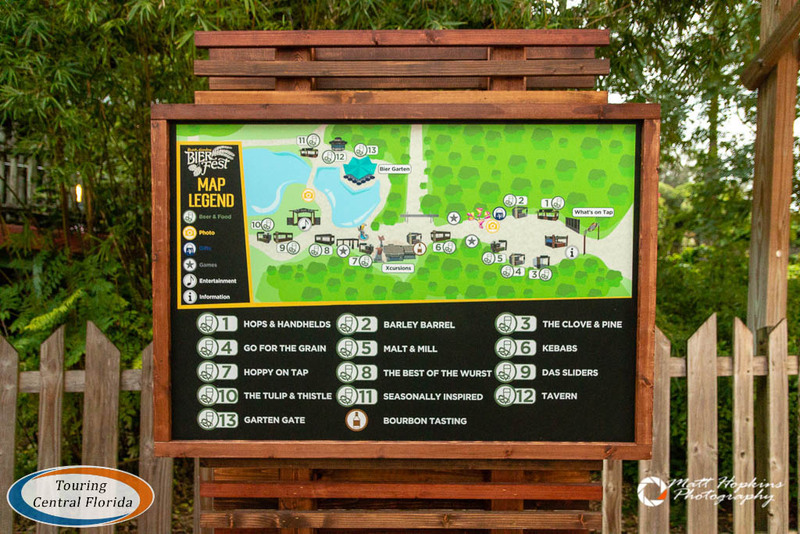 There are a couple of maps stationed in the area, like this one next to the Welcome Center. Snap a picture on your phone so you have it as you walk around! 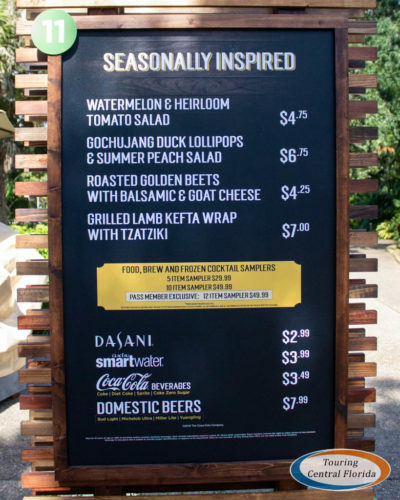 If you’re familiar with Busch Gardens Tampa’s spring culinary event, the Food & Wine Festival, then you’re probably already familiar with the sampler lanyard option, available for purchase at the Bier Fest Welcome Center or any of the festival booths. There are two sampler lanyard options available: a five punch lanyard for $29.99, or a 10 punch lanyard for $49.99. Pass members can get 10% off the price of the five punch lanyard, or get an exclusive 12 punch lanyard for the price of a 10 punch lanyard, though no further discount is applicable. Each item at any of the 13 Bier Fest locations counts as one punch on a sampler lanyard. 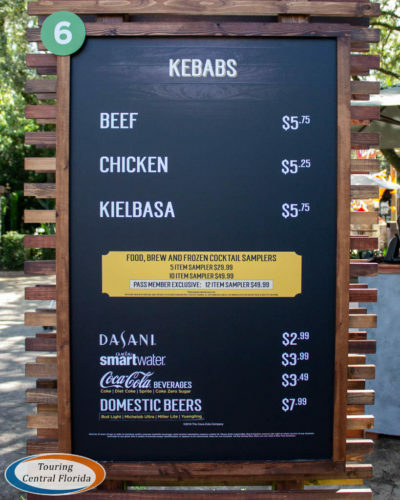 Since the beers are the highest priced options at any of the booths, you’ll get far more value using your punches on the brews than the food items. 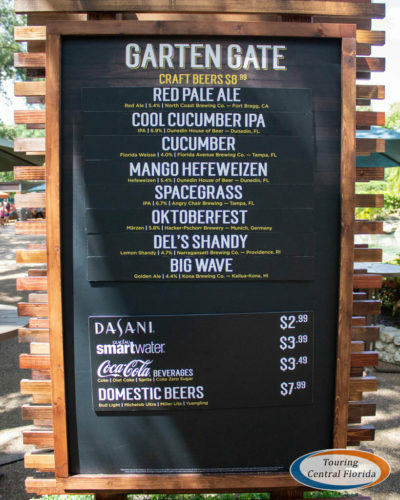 The inaugural Bier Fest at Busch Gardens Tampa features over 100 different brews – but you’ll have to visit each weekend to see them all, as they will be rotating throughout the event. The list includes all kinds of beer, from breweries near and far. 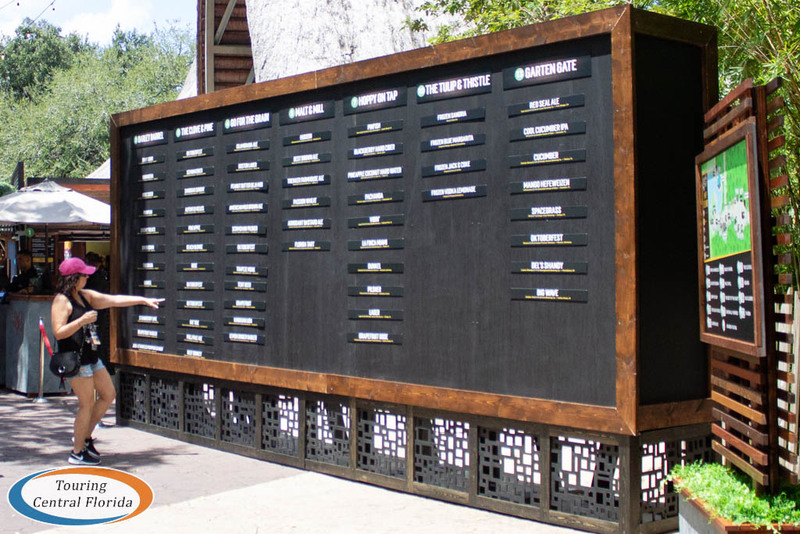 The best place to start your beverage sampling is at the large beer board just to the right of the Welcome Center, where the day’s available brews are listed by location. 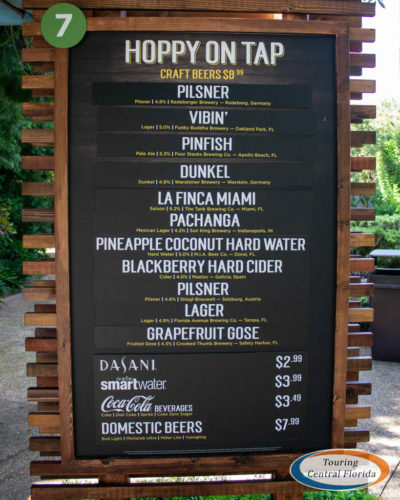 Beers at each location are listed in more detail, including the type of beer, alcohol by volume (ABV) and brewer. There are two sizes of cups at each location. If you use the sampler lanyard, you’ll receive a 7 ounce cup. 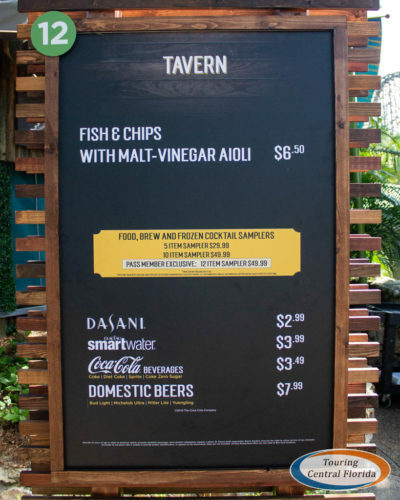 If you pay the full a la carte price of $8.99 (the same at all of the beer stands), you’ll receive a larger cup, around 12 ounces. 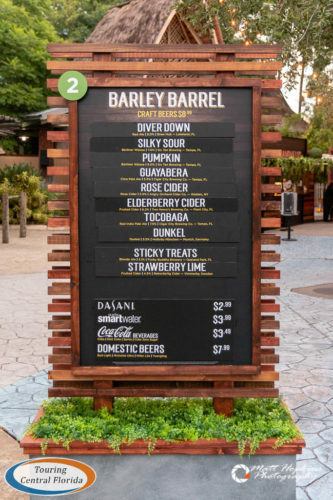 Here are a few of the menus from the first weekend – keep in mind since the beers will rotate throughout the event, the menus will likely look a bit different when you visit. If you’re not a beer drinker, don’t worry, there are other adult beverage options as well. 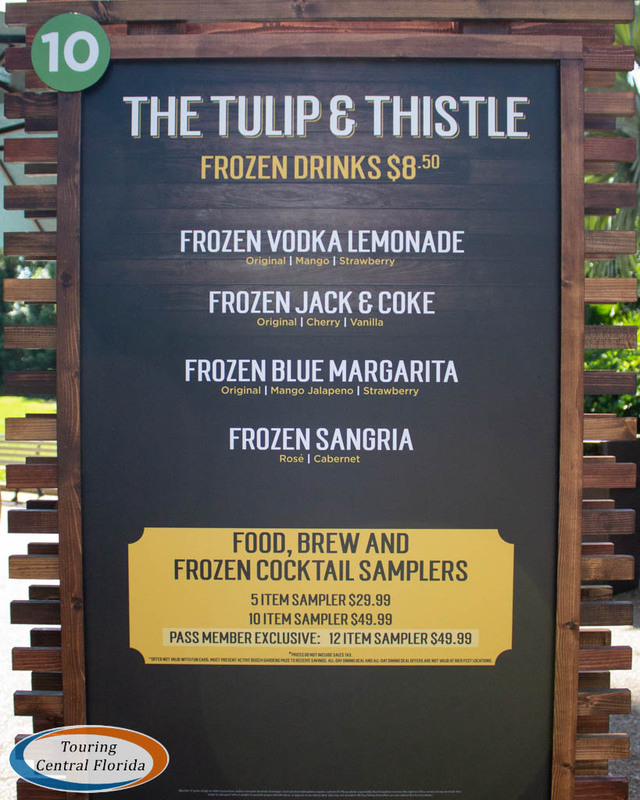 Tulip & Thistle serves up frozen alcoholic beverages, and was quite popular on the first day, often having one of the longer lines throughout the afternoon. 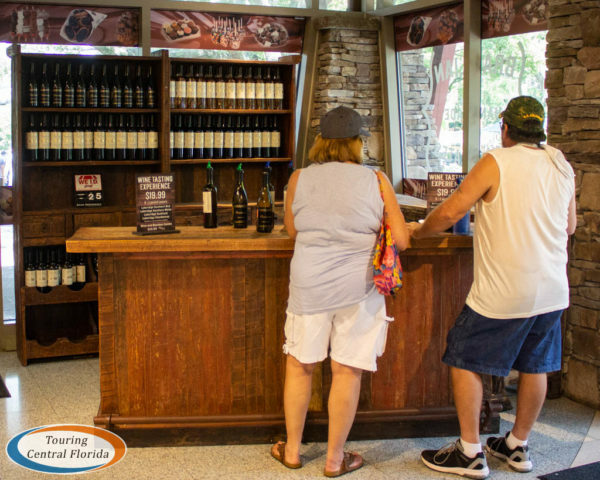 Busch Gardens has also brought back the popular bourbon and wine tastings from the Food & Wine Festival. 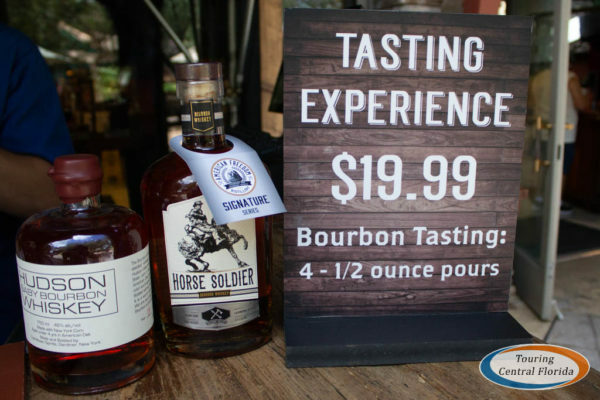 The bourbon tasting is located just outside of Xcursions, and the wine tasting is just inside the gift shop. 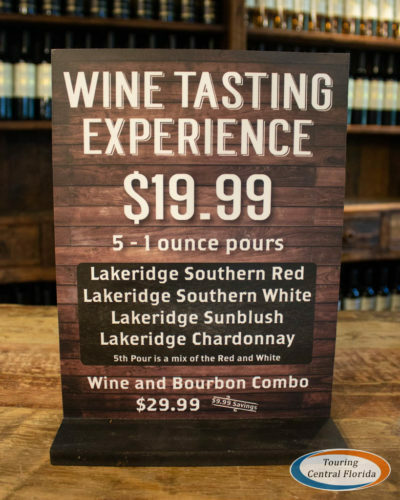 Each tasting costs $19.99, or you can try both for $29.99. 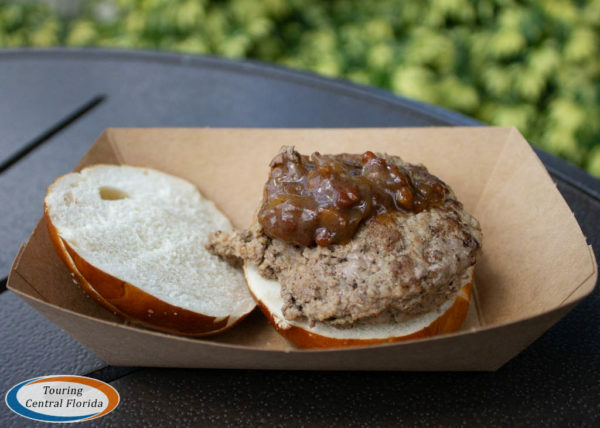 Along with all of the locations serving beer, there are also six spots to sample special food options available only during Bier Fest. 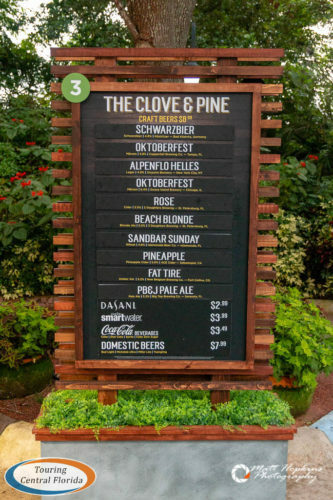 From classic German fare to seasonal flavors, there are 18 dishes that like the beers can be purchased individually or as a punch on a sampler lanyard. Many of the sampler size portions are easily shareable, making it a great way to try a number of the dishes when you visit. 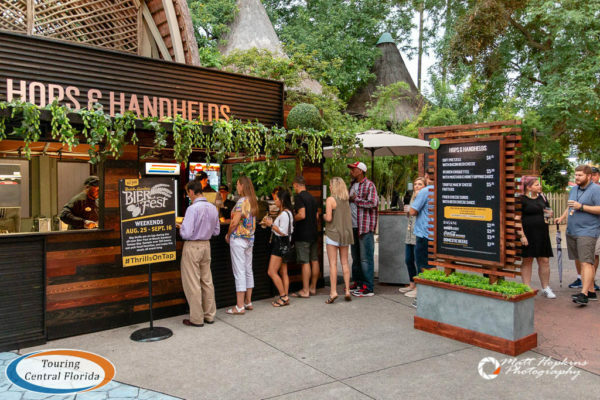 The first food booth at the festival is Hops & Handhelds, and serves up four dishes: Soft Pretzels, Reuben Croquettes, Truffle Mac N’ Cheese Fritters, and Fried Cheese Curds. 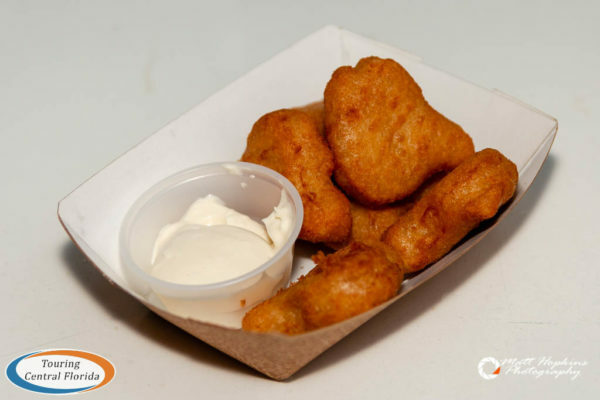 We tried the Soft Pretzels and Mac N’ Cheese Fritters during the VIP kick off event, and found both to be delicious. 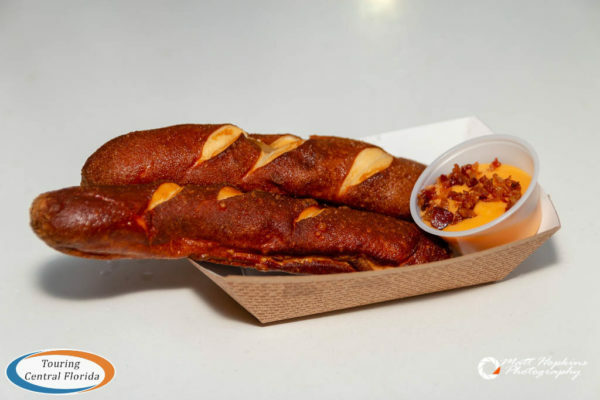 The soft pretzels with cheese sauce are just what you would expect – warm, doughy pretzel rolls and a thick, cheesy sauce. The fritters were good as well, although not especially cheesy. But the dipping sauce made the dish – it’s either the same sauce or very similar to the one used on top of the duck fat truffle fries from the Food & Wine Festival, and it’s awesome. 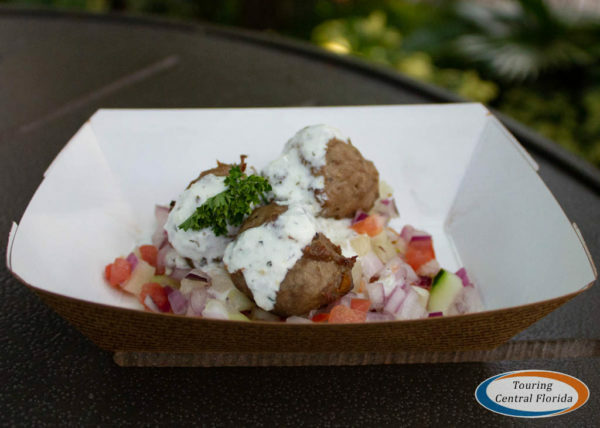 Located near Xcursions, Kebabs offers up three skewer choices: beef, chicken and kielbasa. 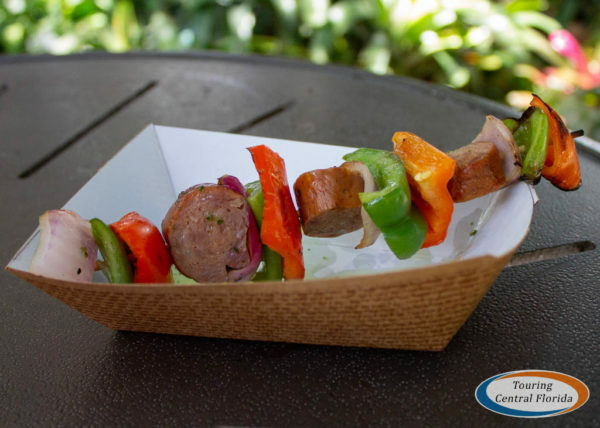 We tried the Kielbasa, and found the flavor of the Polish sausage to be great a mix of spices without being spicy, and the vegetables fresh and crisp from the grilling. We only wish there were more than three bites of meat – the $5.75 price tag seems high for the portion size. 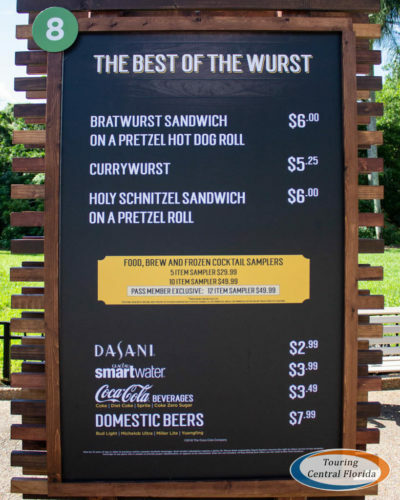 Another bite or two of kielbasa would make it more worth the price tag. The Best of the Wurst features some German fare – perfect accompaniments for a beer festival. We sampled the Bratwurst Sandwich on a Pretzel Hot Dog Roll ($6.00). The thick bratwurst on the big bun was a bit of a challenge to eat, especially with the messy mustard on top. But the flavor is just what you would expect from a brat, and the mustard had quite the spicy kick. 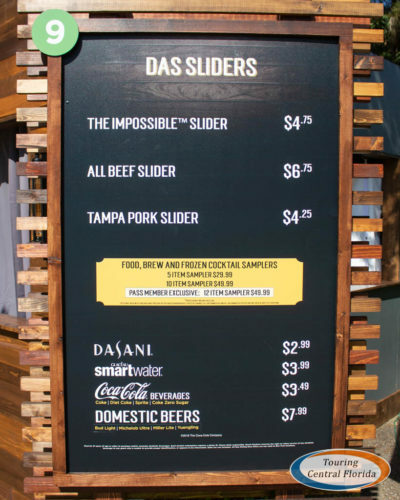 Das Sliders offers up a trio of sliders – a traditional All Beef Slider, the Tampa Pork Slider, and the meatless Impossible Slider. All three are served on a pretzel bun. Take a gander on the left side of the booth, and you may see one of the chefs cooking some of the burgers. From this booth, we tried both the All Beef Slider and the Impossible Slider. The beef patty was cooked all the way through, but was still juicy. For those looking for a meatless alternative, the Impossible Slider was surprisingly good. 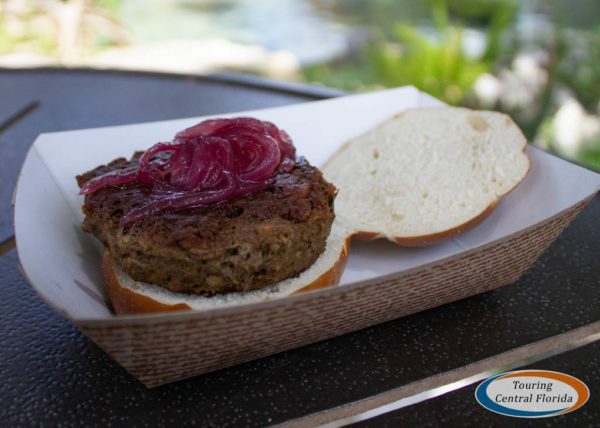 While not nearly as juicy as a traditional beef patty, it did taste a lot like a regular burger and had a very similar texture. 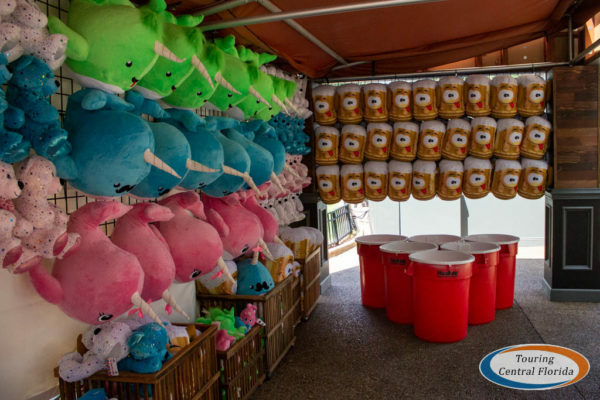 UPDATE: The pricing on the items at this booth changed after the first weekend. The Impossible Slider is now $7.00, the All Beef Slider and Tampa Pork Slider are now $6.00 each. 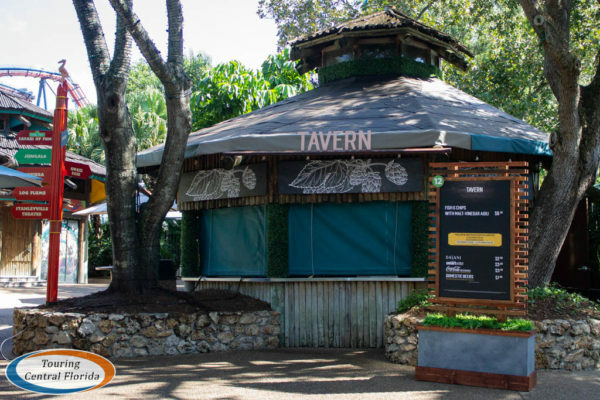 Fish & Chips is on the menu at the aptly named Tavern. 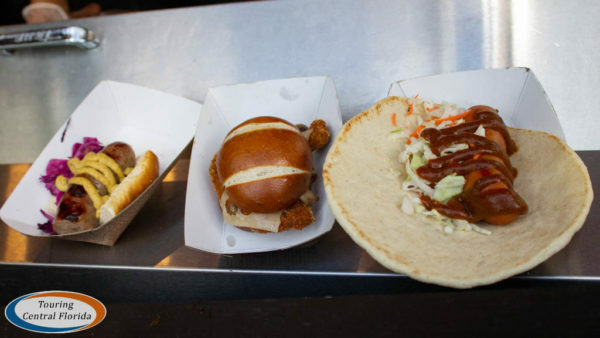 The single dish here is perhaps the biggest portion of any of the options across the festival, and reasonably priced at $6.50. We were served two decent sized pieces of fish on a bed of house-made chips. 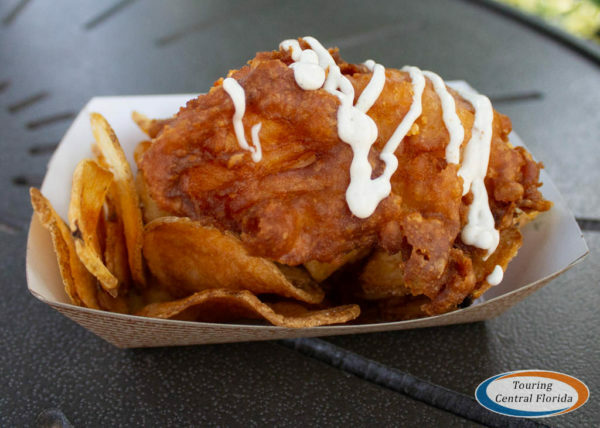 The batter was crispy and had a nice taste, but we didn’t feel the malt-vinegar aioli really added much in the way of flavor. 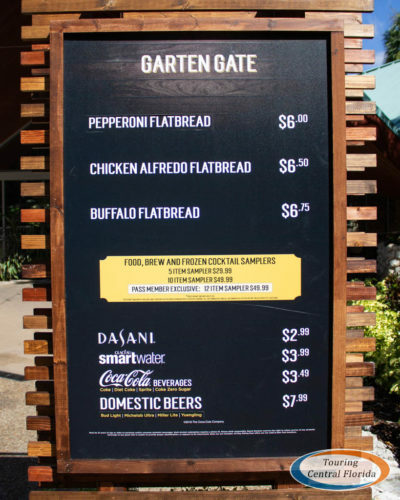 Garden Gate Cafe has been renamed Garten Gate for Bier Fest, and offers up three flatbreads in addition to several beers. 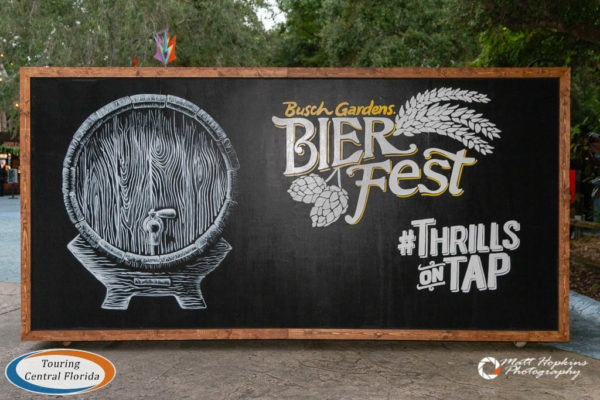 More than just beer and food, there are also several other things to see and do at Busch Gardens Tampa’s Bier Fest. Each event day there is live entertainment scheduled to perform on the stage in the plaza near the lake outside of Garten Gate. 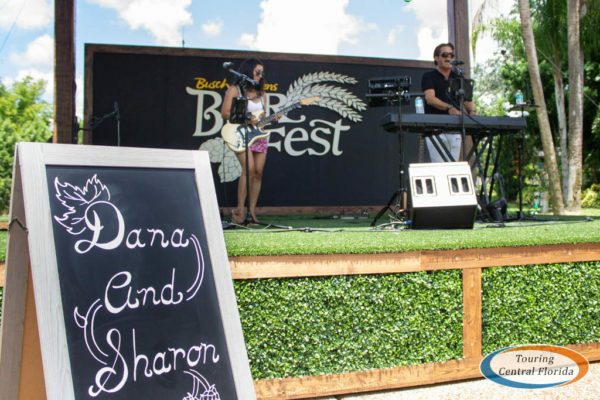 On the first day, local duo Dana & Sharon performed several times throughout the afternoon. 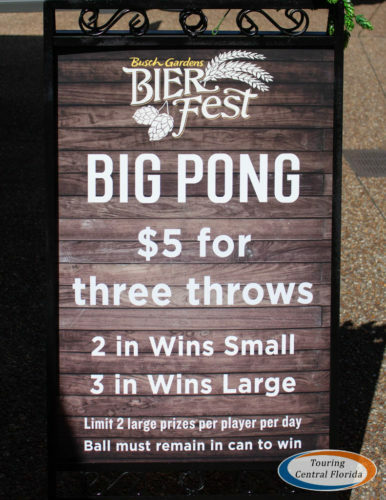 There are also a couple of games along the event pathway, including this “Big Pong” set up that looks a lot like the traditional college drinking game. We saw several guests walking around with their big wins. 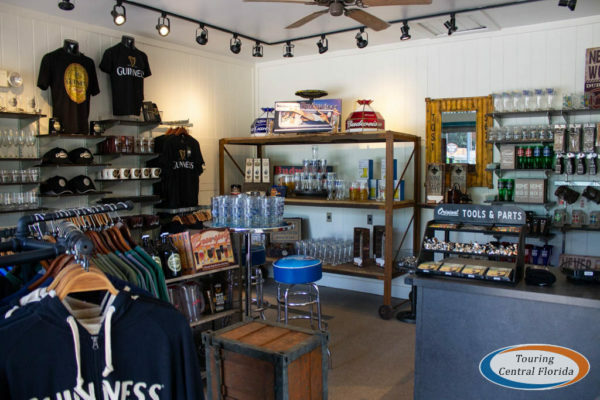 You can pick up some beer related merchandise, too. 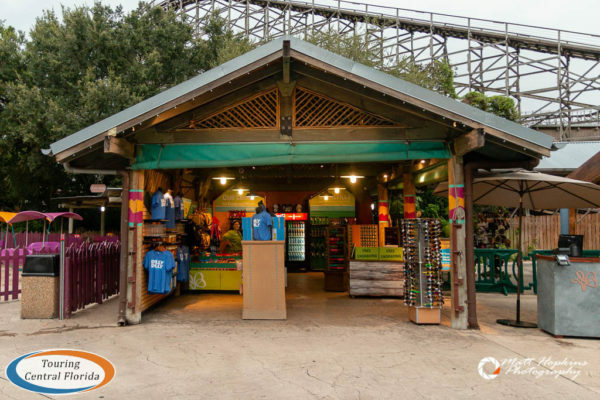 Look for a variety of souvenir items in the former Gwazi exit gift shop, at the entrance to Garten Gate, and inside Xcursions. 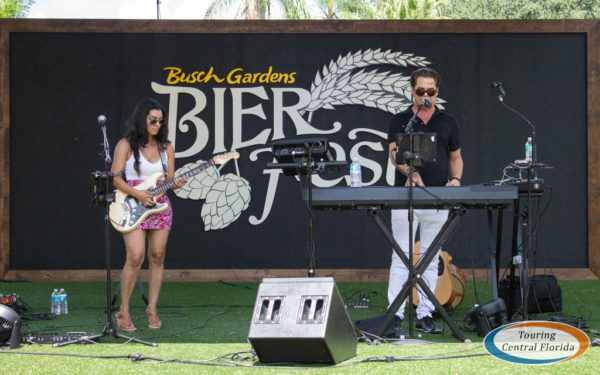 Busch Gardens Tampa’s inaugural Bier Fest is a solid addition to the park’s lineup of special events throughout the year. 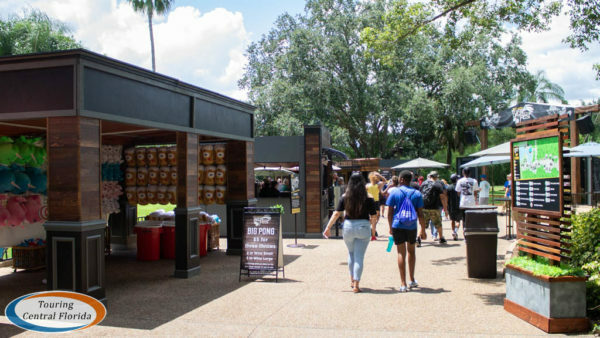 It takes a set of weekends between the summer season and Howl-O-Scream that are traditionally a little slower and adds a reason for guests, especially pass members, to come out and enjoy the park in a new way. 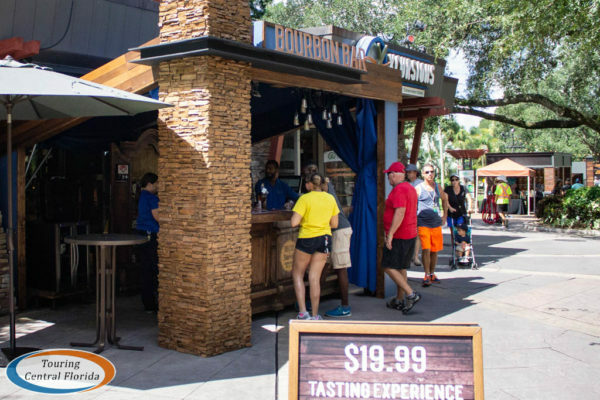 Even though it’s only scheduled to run four weekends (a total of nine days with Labor Day added in), the detailed theming to the booths and number of beers and food options available make Bier Fest feel like a big event and not just thrown together to take advantage of a quiet time of the year. 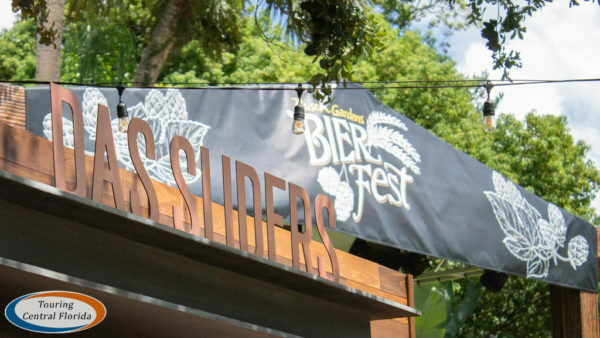 There is always a learning curve with new events, but outside of a few minor operational issues at the beginning of the first day, Bier Fest is definitely on its way to being a success. One complaint we have, and saw several others online and at the event have as well, is the pricing and sizing on the beer samples. 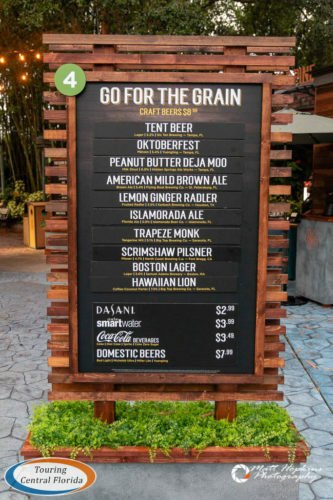 $8.99 for a 7 ounce beer seems a bit high even for theme park pricing; using a sampler lanyard brings that price down but still feels like it could be a better value. It would be nice to see a bit better value overall on the beer either by reducing the price or increasing the sample sizes. With the current pricing, if you plan on enjoying some of the beers, getting a sampler lanyard is a must to get the most value for your money. 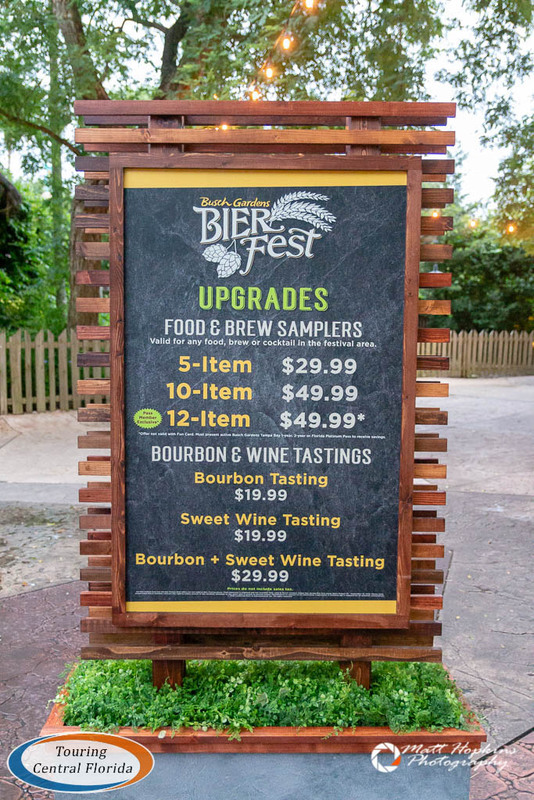 For official details on the brand new Busch Gardens Bier Fest, and to purchase sampler lanyards or other upgrades, visit the park’s website. Special thanks to photographer Matt Hopkins for the use of several of the images in this article. Join in the conversation online using #ThrillsOnTap. 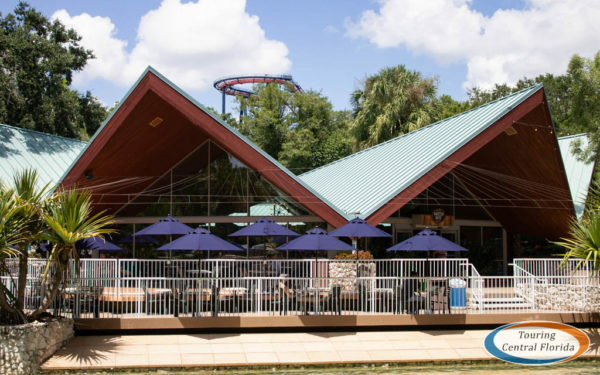 For the latest on Busch Gardens Tampa Bay and other theme parks, attractions and more across the region, be sure to follow Touring Central Florida on twitter @TourCentralFL, @androckb, @Emmet_TCF, @JacobTouringCe1, and give our facebook page a like. 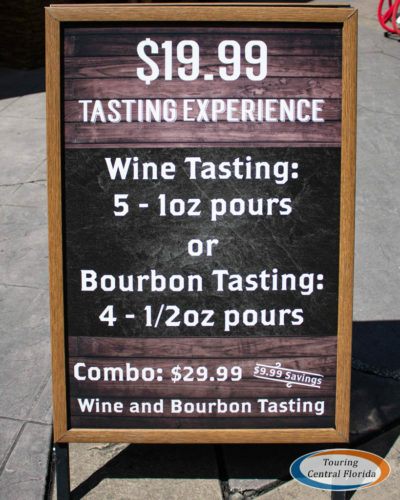 During food and wine the $8.ish get’s you a larger cup than the 7 oz sample. It was either 12 or 16 oz. I’m hoping it’s the same here because nine bucks for seven ounces is a disgrace. I’d just stick with my $5 refills in the brew club. Did you see anyone pay that for a seven ouncer? I’m all about that brat, and a schnitzel sandwich. 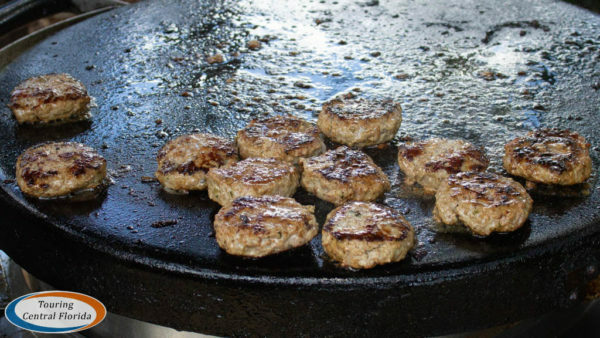 Kefta looks interesting, if pricey, and I agree a keilbasa kabob should be cheaper for sure. Maybe they’ll adjust portions. They have at past events. Lots of people had beer and were lined up at the booths, so I’m sure some of them paid a la carte. But I also saw a number of people with sampler lanyards, which is definitely the way to go. 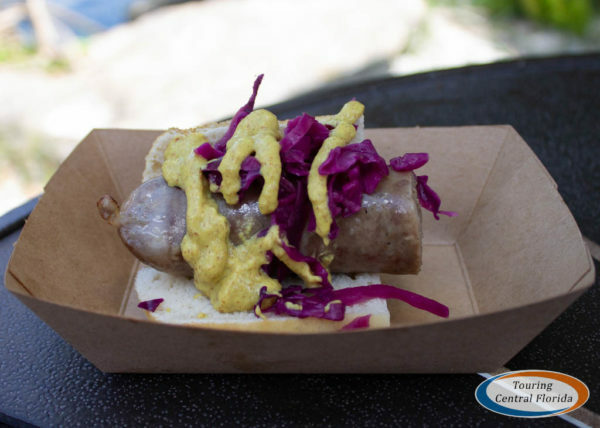 We’re headed over Saturday and will definitely get the passholder lanyard… and bratwurst. Also definitely getting bratwurst. Did you see any wandering musicians? Austin who plays acoustic at special events is amazing, and for a beer festival i hope the accordion is back too! I didn’t see any wandering musicians during my visit Saturday afternoon. 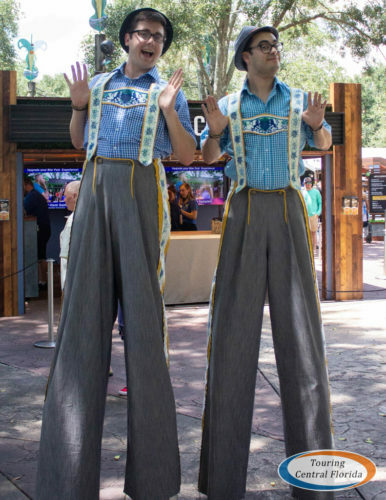 Did see two different sets of stilt walkers around the Bier Fest entrance and the Spritzer Squad. I was there this past weekend and $8.99 will get you a 12 oz. beer, same as the Food and Wine Festival. I had a lanyard, but I saw others buy beer and get the 12 oz. size. It’s still pricey for the size and I wish the samples were larger as well. If you buy a 5-item lanyard for $30 and use it only on five 7 oz. beers, the value is terrible. 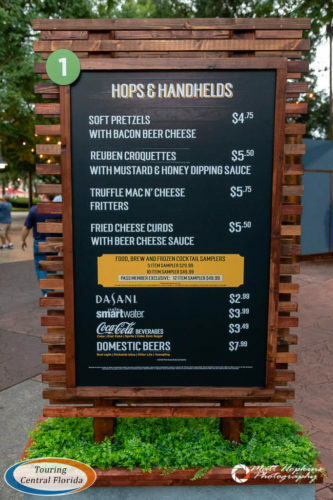 Mixing beer and food with the Pass Member lanyard makes the value better, but it is still pricey for the amount of food and beer you get.